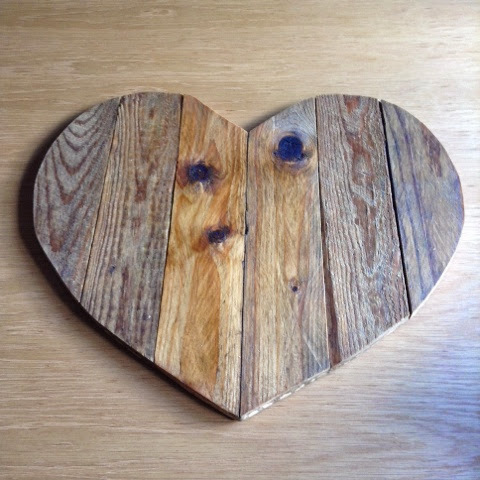 Last week I shared the sharpie plates that I made for our wedding anniversary and mentioned that rather than buy gifts for each other, we had decided to each make a gift for our house, something that we could use for many years to come. The platter shown above is The Hubs project. This project started a very long time ago (like last Autumn!) 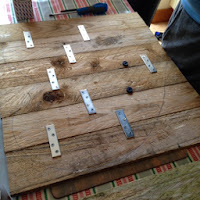 when I asked The Hubs if I could pinch one of the pallets he had earmarked for a compost bin, when I explained to him what I had in mind he said he would make it and that's how we came up with the plan for our wedding anniversary. Suffice to say we still haven't made the compost bin! I showed The Hubs the sort of size I wanted and about 5 months later he started work, he cut lengths and glued them together, after leaving it to dry for a couple of days, he drew the heart shape from a template I provided, then he reinforced the platter with metal plates, because of the size we knew it needed to be strong! 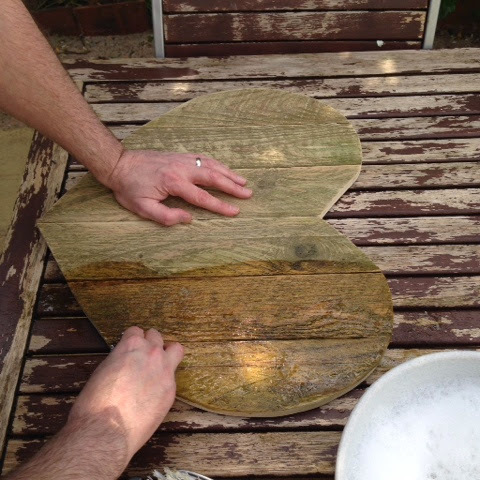 Once the outline was ready, out came the jigsaw, I must admit I was really impressed with how tidy the heart came out, if I'm really honest, I didn't think we'd be able to achieve what I had in my head, but The Hubs managed to create exactly what I was looking for. At this point I'd like to apologise for the state of our patio table! The Hubs jet washed it at Easter and half of the paint came off too, yes another project on the to-do list! 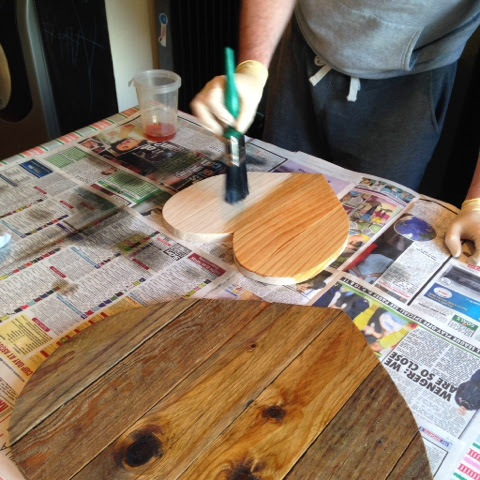 Anyway, once we had our platter, The Hubs gave it a really good scrub with wire wool to get rid of all the patenting, he then treated the wood with linseed oil. We really need to apply a coat of varnish if we are to eat directly from our platter so far we've not done this. The Hubs got so engrossed in this project that he has made a smaller version for my sister although she wanted a less rustic looking one, he's now got another order from a friend for a rustic small one! He's loving it! The final result totally exceeded my expectations, I love it so much and just know that we will use it time and time again, this one is definitely not just to be used on our wedding anniversary. 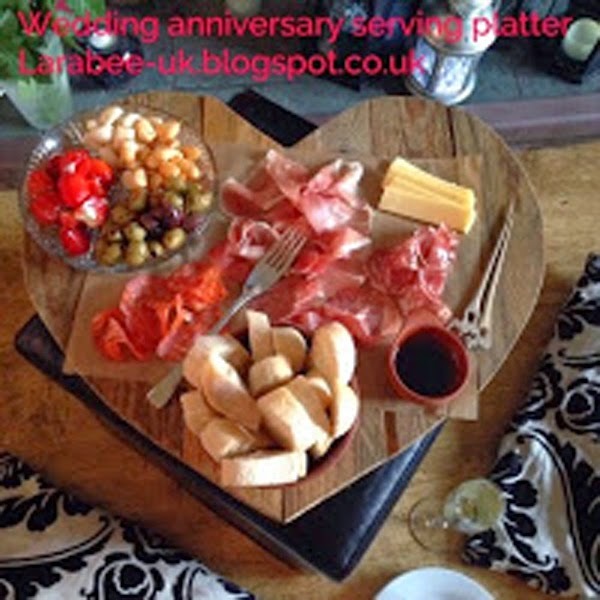 On our anniversary we used the platter to serve anti-pasti, I used baking parchment on the platter and put the food directly on that I felt that this added to the rustic look and so I'm in two minds now as to whether to varnish it or not! 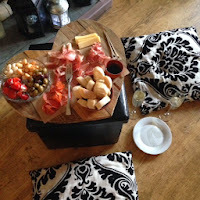 We brought the platter into the living room and sat on the floor with some bubbles and ate from our new plates, it was a lovely new tradition, and we both soon started thinking of different ways we can use our platter, large family ploughman's, as a tray for bbq's or to serve pizza. This is gorgeous, I totally want one too! Shame that DIY is not my husband's strong point!